Shops : Tutto, Giardini, Querlain, d.Fine, Chihuly, Regali, Tesorini, Judith Lieber, Cirque du Soleil. 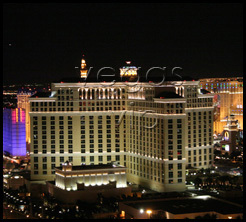 Restaurants : Picasso, Café Bellagio, Circo, FIX, Jean-Philippe Pâtisserie, Le Cirque, Café Gelato, Michael Mina, Noodles, Todd English's Olives, Palio, Palio Pronto, Petrossian Bar, Jasmine, Pool Café, Prime, The Buffet and Sensi, Shintaro. Standard room amenities : cable television, PPV movies, hair dryer, AC, electronic door locks, in-room safe, iron, mini bar, telephone with voice mail. Hotel amenities : VIP Services, laundry, maid service, safety deposit box. 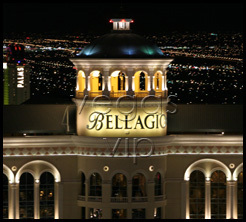 Standing among a sea of bright, neon structures, the Bellagio Hotel and Casino fixed its roots in the place where the Dunes Hotel and Counrty Club once stood. Entry to the hotel takes the breath from the body, as is a theme within the entire resort, when guests gaze at a glass ceiling, carved into a flowery bouquet with beautiful colors. With its gorgeous Tuscan architecture and astonishing sights on property, the level of sophistication and elegance was forever changed in Las Vegas. Just ahead is the Conservatory, arranged by the season with brilliant displays of color and scent. It is a feast for the senses before guests even set foot in their gorgeous room with a killer view. The restaurants at Bellagio whet the imagination as much as the appetite with names such as Le Cirque, an indulgent experience of world-class wines and haute cuisine, Osteria del Circo, a restaurant offering home-style Tuscan food, Picasso, offering food inspired by the regional cuisine of France and Spain, Jasmine, a colorful experience featuring Szechuan, Cantonese and Hunan dishes, Shintaro, offering authentic sushi, teppan yaki and pan-Asian delicacies and Michael Mina, the namesake restaurant of it's star chef, offering exquisite seafood. Shopping at Via Bellagio is high estate and exclusive. 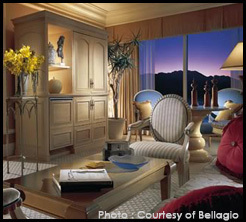 Spa Bellagio offers 65,000 square feet of luxury and pampering. And the entertainment -- from Cirque du Soleil's innovative water-acrobatics show, "O," to the state-of-the-art free Fountain Show in Bellagio's picturesque lake -- is absolutely worth the visit.